I’m looking for a 9 inch Baby Gund #5767 cream and yellow lamb named Jiggles. My daughter lost this lamb while vacationing in Disney world. We believe that the stuffed animal must have gone to the end of the bed and perhaps taken with the sheets to laundry. I have forever been looking for this little lamb, as she believe it or not asks for every night. I too have seen the exact same GUND God Bless Baby lamb. I just know that she will not feel the same. Please dont think that I am being awkward I just know my daughter. My goal is just to find a replacement even if it is used but it has to be that Jiggles lamb! I hope you understand! ebay #160692578155 Bid new with tags! Best Wishes! 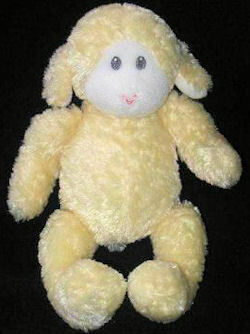 Thank you SOOOOOO Much for helping me find my daughters “Lamby”! I saw the ad on Ebay and have contacted them. Only problemis is that you can not buy it now. I have emailed asking her if they will and make an exception as this would mean soo much to us! I am starting to believe that dreams really do come true. My daughter would be so happy to open this for christmas. Fingers crossed for us please. I just want to say THANK YOU from the bottom of my heart!!! We got “Lamby” on Ebay! Just in the process of getting it shipped to Canada. You have no idea how happy my daughter is going to be on Christmas morning. This is going to be one of very best christmas’ for years to come I am sure. Thank you so very much for making me the happiest mum ever! Merry Christmas! You are welcome!